Home » Japanese Knotweed » How do you know if you have Japanese knotweed? How do you know if you have Japanese knotweed? Chances are you already know you have Japanese knotweed, because it’s so widely reported and discussed in the media. And for good reason. If you have it, it could be reducing the value of your property or presenting a risk of your neighbours taking legal action against you. If you want to sell your house, you had better make sure you know for certain, as declaring it is a requirement of the Law Society TA6 Property Information Form. Once you know you have it, you should then seek help in how to get rid of Japanese knotweed. When present, it’s most likely to be found in a corner of your garden, amongst a densely planted border, or in amongst the shade of shrubs or trees. If you have a particularly large plot of land that’s not managed very heavily, it could pop up almost anywhere. 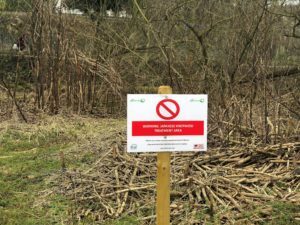 Found pretty much all across the UK, with hotspots in various locations where there’s a lot of brownfield regeneration or other disruption to the ground – such as in South Wales, Cornwall and East London – Japanese knotweed has been amazingly successful at spreading. When happily growing in late spring through to late summer, it can most easily be spotted by its distinctive habit of forming dense stands of bamboo-like stems, which can grow over 2m tall. These are pale green with purple speckles. The leaves vary in size but are usually about the size of your hand. They are shield-shaped, with a flat base – although hybrid forms are more heart-shaped. Towards the end of summer knotweed produces pleasant spikes of tiny white flowers, which often attract bees – as not many other plants produce nectar this late on. By late autumn most of the leaves will have turned yellow and fallen off. The stems can turn a rusty red colour, eventually drying to persistent, straw coloured canes by mid-winter, when they can be quite conspicuous as most other seasonal vegetation would have died back. The life-cycle continues the next spring when new shoots explode (not literally, but they do grow very quickly – cms each day) from bright red/pink crown buds into asparagus like spears. Within a few weeks these grow into the mature canes that form the familiar dense stands seen throughout the summer. flowers are only produced very late in the summer. There’s a lot of information on our website about the issues surrounding Japanese knotweed on property, and, particularly, how to get rid of it.